Our team is well-known between the wind and kitesurf fanatics coming to Egypt practice their favorite sports. More than one student we taught how to use the board, turning the common man into the surf maniac. Many years of experience allows us to refine teaching technique to perfection, so our students reach very fast progress. 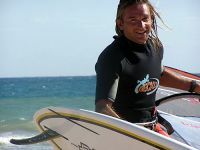 Stephen is a professional sportsman graduated from the College of Olympic Reserves teaching kiteboarding for 10 years and windsurfing for 15 years. He is not just a great coach but the coach by vocation as well. As a founder and owner of ZONE WATER SPORTS, he continues to teach and does it with desire and passion. He charging all around him with love to the life, energy and passion to the sport. Natalia – is a worthy disciple of her coach (Stephen), experienced windsurf instructor for many years. Patient and strict teacher. She is responsible for organizational matters.